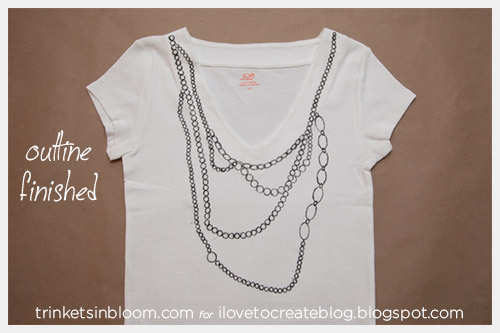 This Trompe L’Oeil Necklace T-Shirt DIY is a fun way to add a simple pattern to a basic t-shirt. 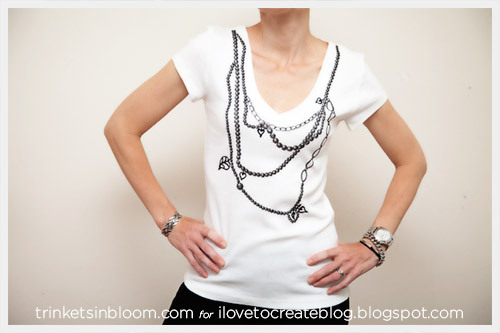 Inspired by the black drawn necklaces on t-shirts by Yves Saint Laurent, this is not only a fun DIY to make it’s also a lot cheaper! My inspiration came from this t-shirt by Yves Saint Laurent. It's a fun loosely drawn necklace that you can easily re-create with your own t-shirt and Tulip's fabric markers and fabric paints! 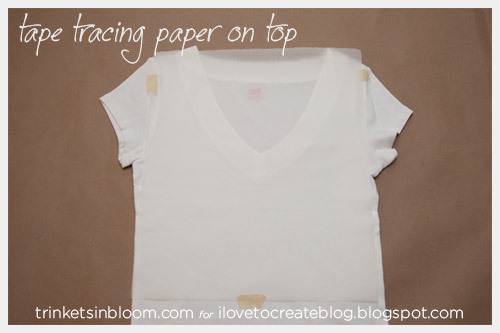 Lay out your t-shirt on a flat surface and place a sheet of tracing paper on top. Tape it down. 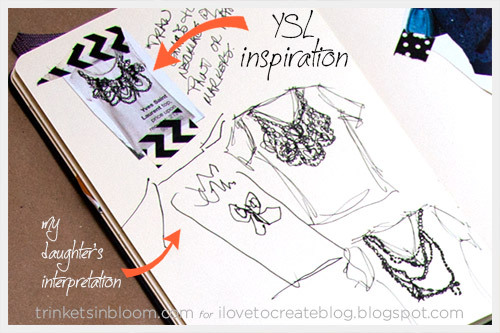 Using your pencil and your templates, draw your necklace design on the tracing paper. When you have your design the way you want, depending on the thickness of your t-shirt, you may want to trace your design with a marker to make it dark enough to see through your t-shirt. 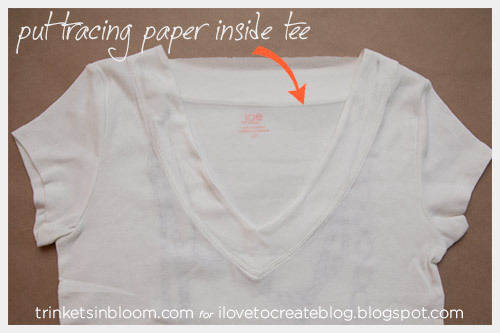 Slide your tracing paper inside your t-shirt. 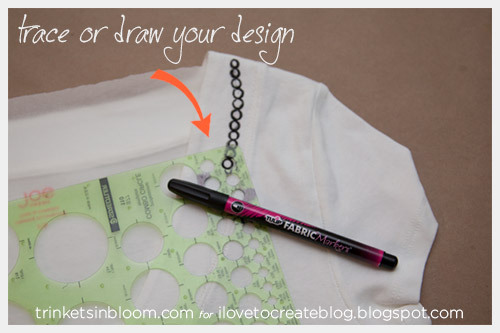 Use your template and your Tulip fabric marker to draw or trace your necklace design onto your t-shirt. 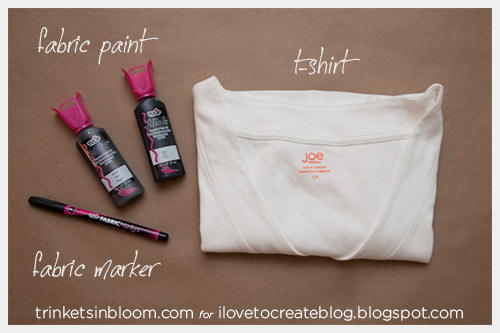 TIP: My t-shirt is a little thick and I didn’t have any problem with my fabric markers or paint bleeding through. If your t-shirt is a little thin be sure to put a heavier paper inside your t-shirt to keep anything from bleeding through. Follow your design template to draw all the outlines for your necklace design. Once your outline is finished you can take your fabric marker and shade in your beads and chain to give it more dimension. 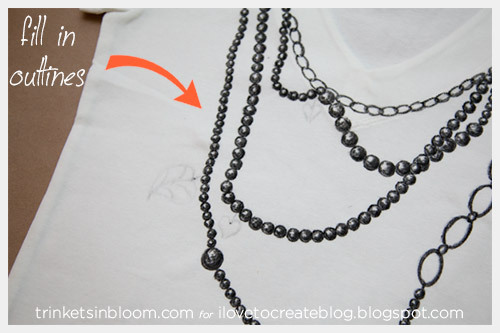 When your necklace is all drawn in the way you want it, you’re ready to use your fabric paint to ‘draw’ your charms and extras on your necklace. TIP: The Tulip Dimensional Fabric Paint is also a good way to cover up any slips or mistakes you might have made with your fabric marker. Let your fabric paint dry. 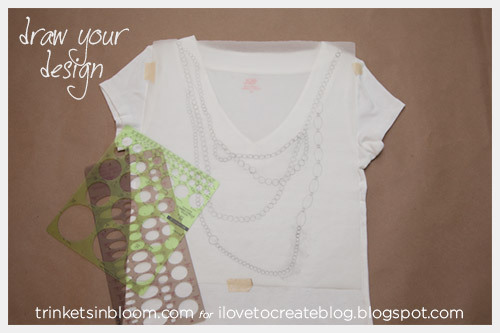 To see more fashion DIY's by me check out my blog Trinkets in Bloom! Great blog...I like layout!!!! thanks for sharing unique tricks.Buy wide range of men’sorporate t shirts,Unique, Creative, Designer T-shirts buy t shirts onlineat Iwearme. Very nicely done. The step-by-step directions along with photos are perfect for DIY novice's such as myself. Found you via WobiSobi. How cute is that! Love this idea. How cute nice it's funny look. At Metal Babe Mayhem, you can choose from a wide array of Handmade Leather Guitar Straps, Heart Rock Women’s White Long-Sleeved Shirt, beautiful Horn’s up Pendant and more. The world's most established protected article of clothing, found by Flinders Petrie, is a "very advanced" material shirt from a First Dynasty Egyptian tomb at Tarkan, c. 3000 BC: "the shoulders and sleeves have been finely creased to give perfectly sized trimness while permitting the wearer space to move. The little periphery framed amid weaving along one edge of the fabric has been set by the architect to enhance the neck opening and side crease." The shirt was a thing of apparel that no one but men could wear as clothing, until the twentieth century. In spite of the fact that the lady's chemise was a firmly related article of clothing to the man's, it is the man's piece of clothing that turned into the cutting edge shirt. In the Middle Ages, it was a plain, undyed piece of clothing worn by the skin and under normal articles of clothing. In medieval fine arts, the shirt is just unmistakable (revealed) on humble characters, for example, shepherds, detainees, and penitents. In the seventeenth century, men's shirts were permitted to appear, with much an indistinguishable suggestive import from noticeable clothing today. In the eighteenth century, rather than underpants, men "depended on the long tails of shirts ... to serve the capacity of drawers.Eighteenth-century ensemble student of history Joseph Strutt trusted that men who did not wear shirts to bed were foul. Indeed, even as late as 1879, an unmistakable shirt with nothing finished it was viewed as despicable. Very useful information. Great blog. A prestigious laundry service provider in Vijayawada is devoted to do any kind of laundry. Extremely dirty clothes, muddy garments of kids, stained attire of workers, delicate sarees, expensive suits, exclusive evening dresses or even curtains and bed linens. Laundromate - StarWhites Logistics is here to do all the essential washing, ironing and even dry cleaning for you. Great Blog And Nice Information Share. It's a really nice work & amazing design. Since I was a little girl, it has always been my dream to own a Volkswagen beetle. After this year they will be going out of commission and I would love to be able to own one before that happens!